Situated right Beside Al Maktoum Bridge. 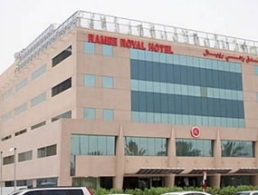 Hotel is in the centre of Golden Triangle of Dubai on an equal distance from Deira, Bur Dubai and Shiekh Zayed Road. All three major business hubs are five minutes away from the hotel. Situated in the commercial hub of Dubai, near Al Karama area next to Al Maktoum Bridge, approximately 5Km away from Dubai International Airport with an easy access to Trade Center & Burjuman Mall the exhibitor’s landmark & the shopper’s paradise respectively. A 10 minutes drive gets a leisure traveler to the open beach.